The best thing about having a perennial garden is hardly ever having to do any work on it while enjoying its beauty year after year. The second best thing about a perennial garden is that the plants multiply by themselves. One can either use them to expand the garden or compost them to return the nutrients back to the soil. About five years ago, we split and moved some irises from one part of the garden to another. Since that time, they have grown a lot and once again become quite crowded. When we decided to not plant a vegetable garden this year and take down the raised-bed, we thought it would also be a good opportunity to divide up the irises. We would move them into the spot vacated by the vegetables. The nice soil is already there and the space would give them a lot more breathing room. 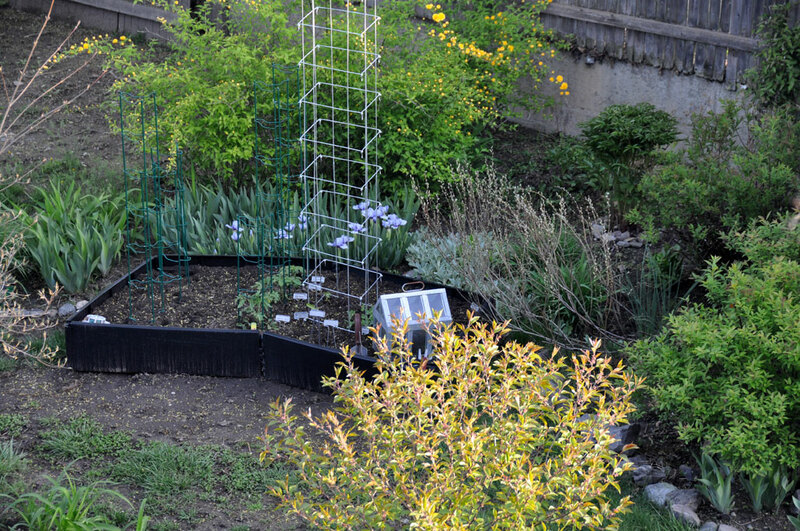 The raised-bed panels were listed on Craigslist and they were gone before the day was over. It went to some nice folks down the street who were looking to expand their vegetable garden. 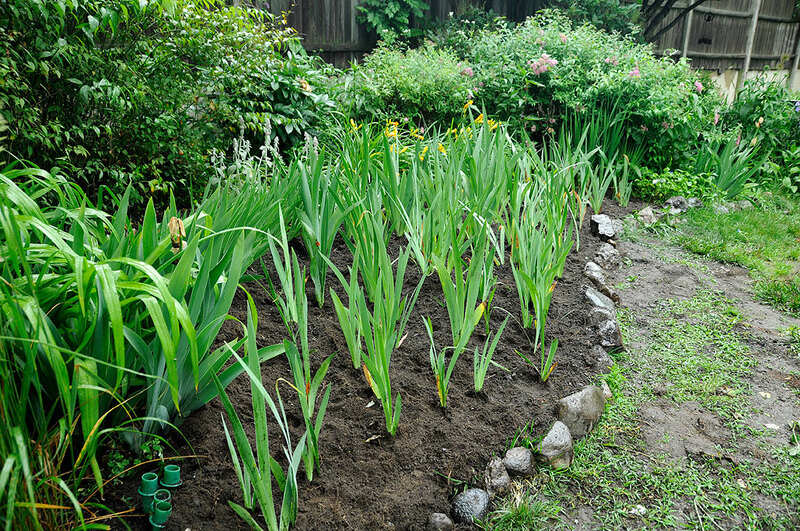 The cool temperature and light drizzle made it the perfect day to dig and divide up the irises. The rhizomes don’t really go very deep into the soil so getting the irises out of the ground was pretty easy. Once they were out of the ground, separating them was just a matter of breaking the rhizomes into smaller clumps. The larger ones can even be just a single piece. The trick is to not bury the rhizome too deeply. Some like to let the rhizome “heal” before planting, but we have had good luck just sticking them back in the ground. So that was how we did it for this new planting. The main thing to understand about irises is that each individual rhizome will only produce just ONE flower stalk ever. After it flowers, the plant will turn its energy toward making new rhizomes. When the new rhizomes grow large enough, then it will flower and the cycle starts again. After a few years, the single rhizome will turn into a clump. If they are not divided, the clumps become overcrowded and deplete the nutrients in the soil. Splitting them will give them room to branch out. We’ll get more flowers, the plant will multiply. A definite win-win for everybody. What was surprising was just how bunched together they were against the Japonica bush. We dug out a strip about four feet wide and a foot deep, but it was enough to fill the 3×6 space left by the old vegetable garden. 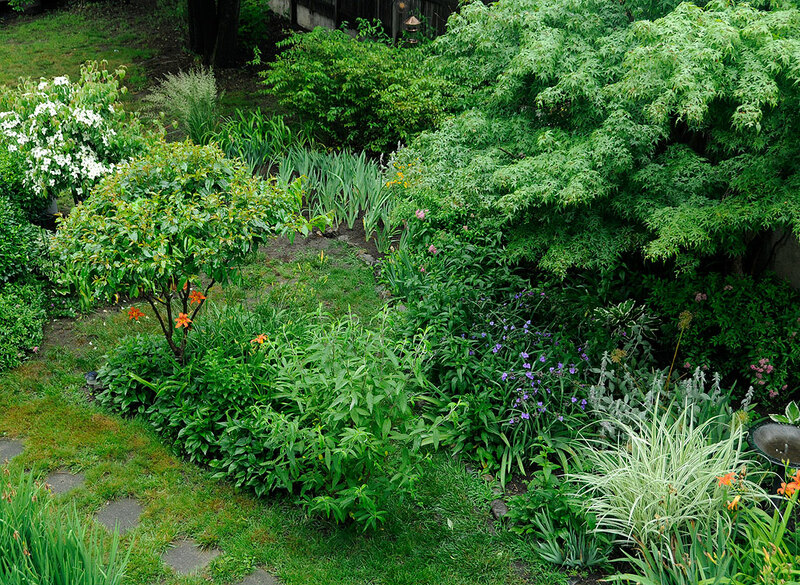 The RainyDayGarden has change quite a bit since 2005. We have moved plants around and opened up additional plots. We have managed to fill a lot of the new spaces by dividing overgrown plants instead of purchasing new ones. A large cluster of irises can make for quite a dramatic display. Perennials may be a little more expensive to purchase, but will pay for itself ten times over if you plan on propagating them. They are definitely the way to go for those gardening for the long term.